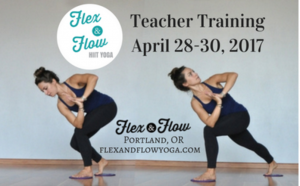 As we’re nearing the kick-off of our very first HIIT Yoga teacher training here at Flex & Flow, I can’t help but think about when I did my very first YTT. Nearly six years ago. I had to think about how long it’s been since I did my training when Caitlin asked me the other day. In some ways I feel like I’ve been teaching forever, and in other ways like I’m still the new kid on the block. I remember teaching my first real yoga class. It had been over three months since I’d finished my training, and I had only lead a 15-minute audition before I showed up to my new studio in my new hometown to teach. For the first months of teaching, I planned every class. Now, that’s not uncommon. Many teachers plan a daily or weekly flow through which to lead their classes. But I was so nervous, even though I’m very comfortable speaking in front of groups of people. I was nervous enough that I planned out every breath of the class. Seriously. Every. Single. Breath. Inhale: Arms sweep up overhead. 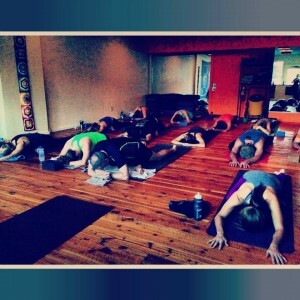 Inhale: Upward facing dog / cobra. 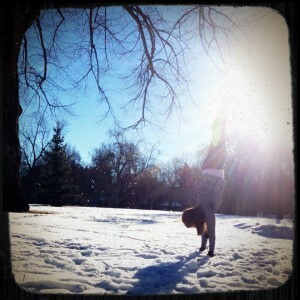 And that’s only half of a sun salutation, which takes about 30 seconds. So you can imagine how long it would take to plan every breath of a class! Other than getting more comfortable teaching, I stopped doing this mostly because it never went according to the plan. I would plan a class that built to grasshopper and no one would take side crow, a prep pose for my pinnacle pose. When I first started teaching, it was at a new studio in Ski Town, Colorado. Everyone coming to yoga wanted it as a stretchy counter to skiing and mountain biking, rather than the physically challenging class I had planned. By the time I moved, people were coming to yoga as training and were ready to throw down with whatever I brought. But I had to learn to adjust very quickly, and stopped investing so much time planning a class that I would never complete. I completed my 220-hour (yup, an extra 20 hours) training in three weeks. That means eating, sleeping, breathing, pooping yoga all day every day for three weeks. I did it during the summer between graduation and moving to Colorado. It was the perfect time to completely devote myself to my training, as was the nature of the immersion program I’d selected at my home studio. Apparently I’m a fan of immersions, throwing myself completely into an experience. I have quite the track record: summer camp every year growing up, studying abroad in college, NOLS (aka living in the woods for a month), and all the way to my YTT (yoga teacher training) and retreats. Diving headfirst into an experience lets me focus my attention without outside distractions! If it had been an option, I would have completed my training over 6 months at my studio where I went to school. I can only imagine how distracted I would have been trying to balance my work load, playing field hockey, and the social life of a college student with studying to be a yoga teacher. I also love the bond that forms within a group during an immersion experience, whether it’s a trip, a beautiful view, an educational training. To have a companion, or 30, while going through something new, taxing, overwhelming, amazing, challenging, or all of the above only sweetens the experience. And gives you the comfort of knowing you’re not alone, that someone knows how you’re feeling and what you’re going through. One thing I loved about my training is we got tidbits of knowledge about a lot, with the intention of going on to further specialize. So I got to play with kid’s yoga. I started to learn how to assist and adjust students. We had sessions devoted to all kinds of yoga: Kundalini, Bikram, Ashtanga, Jivamukti, Yin, Viniyoga, Anusara, and more. I loved the overarching vinyasa theme while getting to taste test, so to speak, many other kinds of yoga. Some I’d never even heard of! 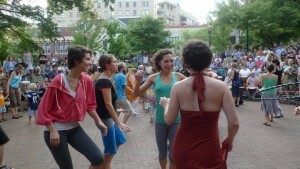 Plus we got to experience all of it in beautiful Asheville! Not too many YTTs include drum circle dancing! 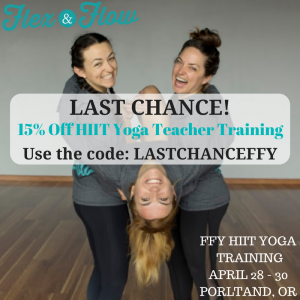 Ready to dive into the world of HIIT Yoga?! We’re SO excited to be launching our very first teacher training next weekend. 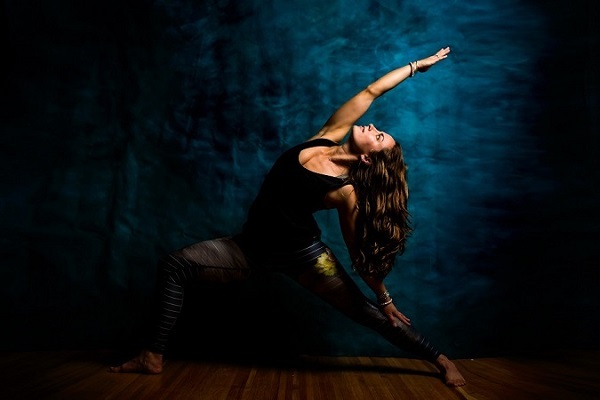 This 12-hour intensive training will break down what HIIT Yoga is and how to sequence a class, review anatomy, and discuss how to build your own brand and your business. Plus, we’ll be having all the fun and getting all kinds of sweaty all weekend long! Need more reasons to join in? Here are 5 reasons joining in on this training is a must from Flex & Flow HIIT Yoga teacher Nicci. You can also get a sneak peak on how HIIT Yoga was created and why it’s so amazing in this interview with creator Jamie King. AND here’s a special last chance discount code to join in next weekend! See you on the mat, and on the gliders! Love immersing myself! Best way to learn! I can see your detail oriented brain planning out classes right now :-). All that work and diving right in paid off – you’re such an amazing teacher!!! Hehe I’m so glad I don’t have to plan to that extent anymore. It’s so fun to read about your teacher training journey! I often wonder about the teachers at my studio and how they got into it, sometimes they mention it. They just started a teacher training there that follows the 6 pm Friday class and I keep seeing them all file in. Seems so awesome!